Editor-in-Chief Dr. Sarah K. Anderson, Ph.D., Mayville State University, USA. 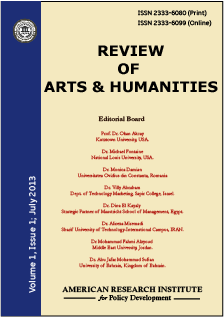 Review of Arts and Humanities is an international journal that fosters a dialogue between the humanities and arts and the bio-medical, psychological, behavioral, and social sciences. All articles in this journal have undergone editorial screening and double-blind peer review by at least two reviewers. The aim of the editors is to publish timely, useful and informative results that will be of value to a general audience. Every article published in our journal is promoted to researchers working in the respective fields. Each paper published in Review of Arts and Humanities is assigned a DOI®number, which appears beneath the author's affiliation in the published paper. Click HERE to know what is DOI (Digital Object Identifier)? Click HERE to retrieve Digital Object Identifiers (DOIs) for journal articles, books, and chapters. Dr. Sarah K. Anderson, Ph.D., Mayville State University, USA. Cynthia S. Johnson, Ed.D., Department of Educational Leadership and Administration, Gonzaga University, USA. Dr. Carrie J. Boden-McGill, Department of Occupational, Workforce, and Leadership Studies, Texas State University, USA. Dr. Maria Rosário Justino, Professor, ISCAL- Polytechnical Institute of Lisbon, Portugal. Dr. Julian Vasilev, Department of Informatics, Varna University of Economics, Bulgaria. Dr. Daniel Flaut, Dept. of History and Political Sciences, “Ovidius” University of Constanta, Romania. Dr. Nisar Ahmad, Professor, Imperial College of Business Studies, Lahore, Pakistan. Dr. Faisal G. Khamis, College of Business Administration, Al Ain University of Science and Technology, Al Ain – UAE. Nazmi T. Al-Shalabi, Associate Professor of American Literature, The Hashemite University, Jordan. Dr. Dacosta Aboagye, Dept. of Geography and Rural Development, Kwame Nkrumah University of Science and Technology, Ghana. Dr. John Koskey Chang’ach, Dept. Educational Foundations Moi University, Eldoret, Kenya.